This breed's name comes from the French word Mechlinian which means shepherd. They are also known as the Belgian Shepherd Dog. This sporting breed originates from Belgium and is a relative to the German Shepherd Dog but have a boarder, more square build. This breed is a working dog often used in field trials and schutzhund or as a police dog. They have a high prey drive but tend to have a friendly, high strung demeanor. 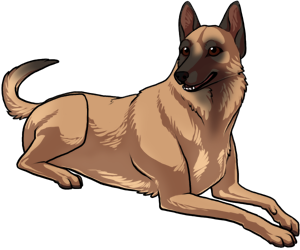 Belgian Malinois have a relatively high number of health problems but through selective breeding typically have fewer health problems their German Shepherds.